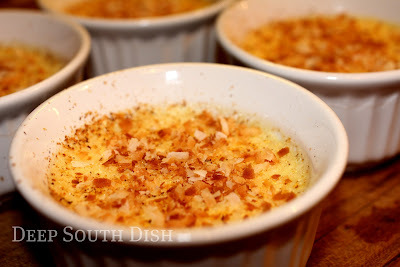 Old fashioned baked custard made from eggs, whole milk, sugar, nutmeg and vanilla with a sprinkling of optional coconut. I had a taste for some old fashioned baked custard the other day. Whether it was the freezing weather prompting the simple warmth of the hot custard itself, or because I hadn't been eating enough eggs lately, the craving was very specific. I wanted this delicious, heart warming custard. Course, I really don't need a strong craving for me to enjoy custard - either straight from the oven like this, in the old fashioned simplicity of a custard pie, or in the form of the creamy homemade custard in my banana pudding - I have always adored this pure mix of egg, milk and sugar. My favorite way is simple, unadorned and piping hot from the oven, but this time I decided to make it with some toasted coconut. It was excellent, but if you don't like coconut, it'd be equally wonderful even without it. A slow gentle heat is best here for cooking the custard, so use a nice water bath to bake them in, or a Bain-Marie (bahn-mah-REE) if you wanna get all fancy. That simply means cooking one container, the ramekins, in a larger container, the baking dish, surrounded by hot water. Egg proteins can be rather sensitive, so a slow gentle heat provided by the cushion of hot water will keep them nice and smooth and will help prevent curdling. Preheat oven to 325 degrees F. Butter six small ramekins; set aside. Heat up enough water to fill a 13 x 9 inch glass baking dish halfway. Heat milk to near boiling in the microwave or on the stovetop; set aside. Toast the coconut in a skillet; set aside to cool. Reserve one tablespoon of the coconut for garnish. Whisk the eggs; beat in the sugar a little at a time. Add the salt and slowly beat in the hot milk, a little at a time, so as not to scramble the eggs. Add the vanilla and all but one tablespoon of coconut. Pour evenly into six small ramekins. 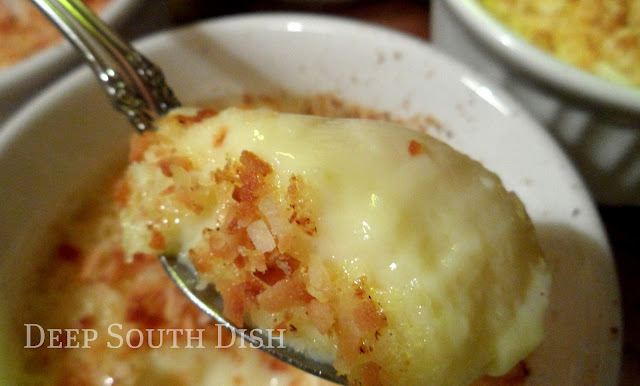 Sprinkle tops of each ramekin with a fresh grating of nutmeg. Set the ramekins in the baking dish, and slowly pour the hot water around them, up to just under the rims, taking care not to allow the water to come up over the tops. Bake at 325 degrees F, for about 45 minutes or until knife inserted comes out clean. Remove from the oven slowly to avoid splashing water into the ramekins and using an oven mitt, carefully remove each ramekin from the water. Sprinkle the reserved coconut over the top of each custard as a garnish. Let cool; can be served warm or cold. Makes 4 to 6, depending on the size ramekins used. This sounds like a wonderful winter dessert, thank you for sharing...:)! I grew up on this stuff. My mom made it all the time and I've not made it in years. I don't believe she put any coconut in hers, I'll have to find the recipe. It's delicious. Hi CG! It really is a perfect and warming winter dessert. Simple but so good! Thanks for stopping by!! Hi Lea Ann! I typically just make a plain custard myself, but decided to try it with some coconut this time. Was very good! I adore homemade custard! It's one of those comfort foods from my childhood and for my first 4-H dairy foods project, I practiced and practiced until I got it "just right". I usually like mine sprinkled with nutmeg before baking, but I love your use of toasted coconut here. These look wonderful! You had me at custard! Yum. I have yet another one to add to my list. Thank you for sharing this with us ma'am. Hi Marla! That was some list you had up. I don't get around to visit as much as I'd like to, but I try my best. Thanks for stopping by to visit me! Hey Krista, I also do the nutmeg on top, you probably can't see due to the coconut, but what would custard be without nutmeg?!! Megan you must be a lover of all things custard too I take it? This looks so good! comfort food for sure! Yum! That looks super easy, I have got to try it! Cant wait to try this! Do you think if you omit the coconut & after baking, stick in the frig, then carmelize sugar on top, it would be like creme brulee? Hey Michelle! Well, not exactly. I'm sure that it would be quite good but creme brulee is more dense, usually using more eggs, and if I'm correct only the yolks. It's a bit more firm and richer than a plain egg custard, though the taste will be somewhat similar. I love making custard pie. I think I've flooded my blog with custard pies - lol! Delicious! This reminds me that I need to re-hone some of my basic skills. This was one of the first things that my grandmother taught me how to bake. First was a basic egg custard. When I mastered that, I could then move on to coconut custard and then one of my all time favorites, rice pudding; that was challenging, especially for a 7 year old kid. I learned early on to put the water in the pan… after it was in the oven. D’oh! I still have several of those old, from the early 20’s, Pyrex custard cups. They’re still used on a daily basis for everything from deserts to… whatever. Thanks for the recipe and the reemergence of some old sweet memories. God bless. Thank you Chris! That's really one of the main purposes of this blog - to keep those recipes alive!